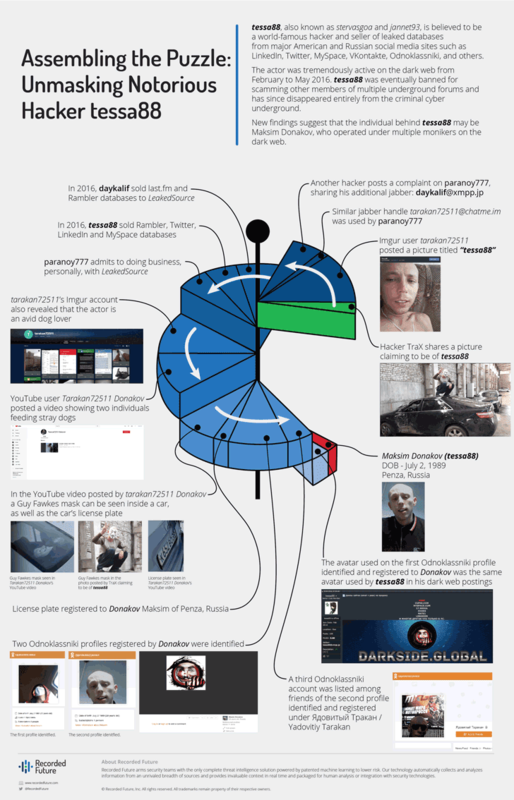 Though Tessa88's profile was active for a few months between February and May 2016, the OPSEC analysis revealed that the same person was involved in various cybercriminal activities since as early as 2012 under different aliases including "Paranoy777," "tarakan72511," "stervasgoa," "janer93" and "Daykalif." Researchers with US-based threat intelligence firm Recorded Future's Insikt Group used a combination of their own data, dark web activity, multiple chats and email accounts associated with Tessa88 to find a connection between his other online aliases, and collected information from publicly available sources to unveil his true identity. Researchers identified an online account "tarakan72511" on Imgur, a popular online image sharing service, who posted screenshots of discussions regarding the Yahoo and Equifax breaches. 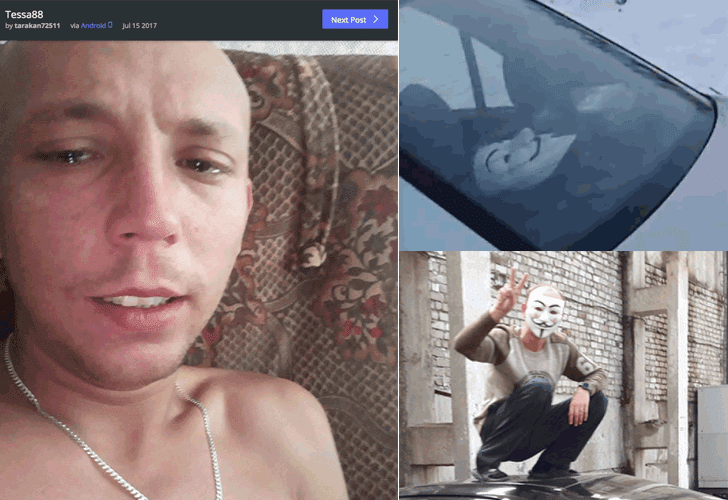 On the same account Tarakan72511 also posted his real picture titled "tessa88" in 2017, which links Donakov with tarakan72511 and tessa88. 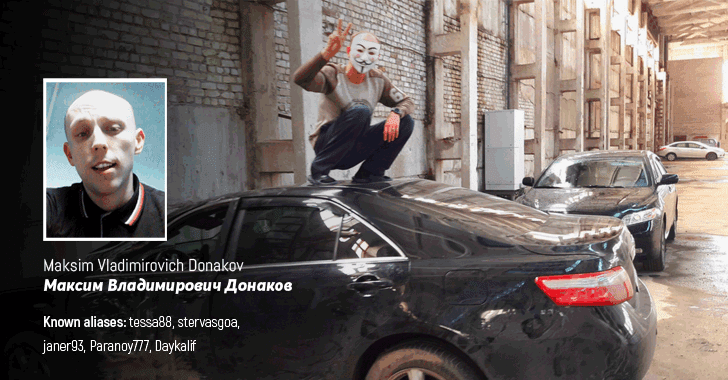 After exploring several confidential sources, Penza records, and Russian crime database, researchers find Tessa88 as Maksim Vladimirovich Donakov (date of birth: 02/07/1989), whose persona matches with the YouTube username 'Donakov,' Mitsubishi Lancer and person revealed in Imgur picture. After the comprehensive investigation, Recorded Future, with a "high degree of confidence, concluded that Donakov is the man behind the sale of the extensive databases, including 32 million Twitter accounts, 360 million Myspace credentials, and 500 million Yahoo accounts. At the time of a series of so-called 'mega breaches' in 2016, another online alias that came up was Peace_of_Mind — a separate hacker who was seen selling 117 Million LinkedIn emails and passwords and 200 million Yahoo accounts in 2016 on the currently defunct TheRealDeal Market. According to Recorded Future, Tessa88 and Peace_of_Mind made an agreement in May 2016 on sharing some of the stolen databases in a "likely attempt to expedite monetizing the massive amount of data between the two." Recorded Future hopes that the upcoming criminal case of Nikulin, who is now also a person of "great interest" in the US probe of Russia's meddling in the US presidential election, will shed some light on the gaps in the story.